The baby's changing table was customized with gold metallic paint and the nursery walls are painted with silver metallic Martha Stewart precious metals paint. 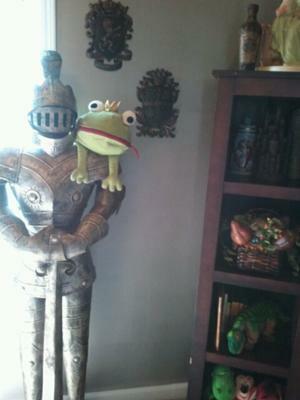 This isn't a frog prince nursery theme but the stuffed, green frog on the shoulder of the knight's armor adds a whimsical touch to the decor. Our family spent quite a bit of time decorating our baby prince's nursery but it was worth every minute it took and every penny we spent because the end result is that it is that the room is now fit for a king! 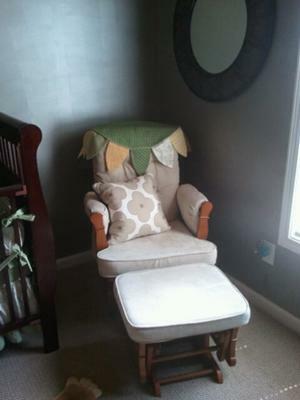 Since most of the decor for his room was found either at Hobby Lobby, the Goodwill secondhand store or bought used off of craiglist.com; we actually decorated a designer nursery in a thrifty manner. We worked hard to give old furniture a medieval look and are very pleased with the outcome. For starters, we custom designed the baby's changing table that started out as just an old and ugly piece of used, wooden furniture. But after we finished giving it a makeover its appearance was truly "royal" in every regard. The transformation was amazing but took several time-consuming steps. 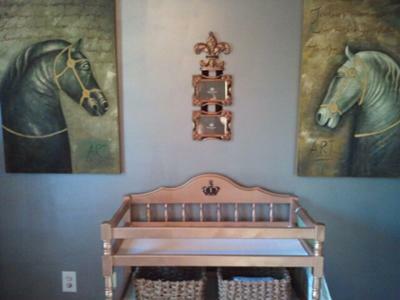 We painted it with three coats of gold metallic paint, put white liners on the shelves, added storage baskets we found at Hobby Lobby and as a finishing touch, glued on the crown (also found at Hobby Lobby) to let everyone know that "royalty gets a diaper change here". The gold paint color that we used on the changing table really shines next to the walls that are painted in a silver metallic Martha Stewart precious metals paint. To balance the color scheme in the baby prince nursery theme we repeated the gold metallic paint color on the ceiling. 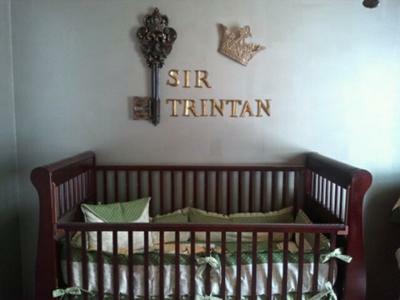 Adding to the castle-like atmosphere, our baby boy, Trintan, has his own knight in shining armor standing watch in his nursery that is a gift from his godparents. The room is filled with DIY projects and decorations. Only the baby bedding and window treatment are custom made. We hope that Unique Baby Gear Ideas' visitors love the DIY projects in our baby boy's prince nursery theme as much as we all do and that they will see something they want to try for their own royal nursery room. I love the look of your changing table. You don't mention the brand or name of the metallic gold paint that you used for this project or whether you brushed or spray painted the piece. Could you please advise as to which route you took to get these great results? Join in and write your own page! It's easy to do. How? Simply click here to return to Prince Baby Nursery Ides.